At J&R Construction we have Professional interior designers on staff to help every step of the way. We also partner with several Certified Interior Designers and Firms in Lexington and Owensboro, along with many Architects. 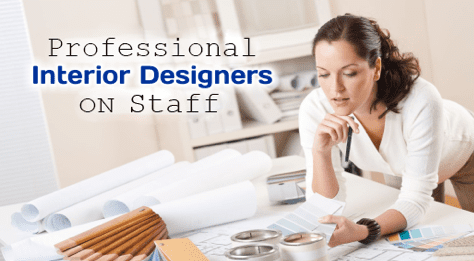 Our designers or architects will draw your project using our design software system that can show you the final project in 3-D and even change colors of fixtures and finishes in real time, so you can visualize your project in its entirety before we even start. Once your project moves forward we assist by taking you to our trade partners’ showrooms to help you determine all the necessary selections for your project: plumbing fixtures, flooring, electrical fixtures, cabinets, counter-tops, etc. We also carry several cabinet lines, so that you get semi-custom or custom cabinets without breaking the bank. Our folks work with you throughout the entire process and project. We even apply the paint samples if needed, so you can decide what color would be best in all lighting. Having Professional Designers on staff and as partners, this helps us serve everyone with the best Customer Service and Quality First.